A cop's badge is perhaps the most visible and recognizable symbol of policing around the world. It's seen by many as a sign of authority, sacrifice, and service. Although it's most closely associated with public service professionals such as firefighters, correctional officers, and especially police officers, the use of badges actually long predates the modern concept of law enforcement and policing as we know it. When you think of the word "badge," you most likely picture the metal shield, star, or similar emblem worn by officers and firefighters. In fact, the term is used to describe any small object such as a name tag, pin, or emblem that can be displayed, often prominently, to identify an individual. This is the concept from which the badge originated and from where the modern police badge evolved. European nobility was known for their use of heraldry, coats of arms, and insignia to represent their House and their history. During the Middle Ages, a time when power was not consolidated and national borders were far more fluid than they are today, badges were worn by commoners and nobility alike. This showed their allegiance to a House or to a group, and the wearing of badges was not limited to a specific job or duty. These badges were made of various materials, including cloth, metal, and even jewels. Eventually, servants and others tied through employment or oaths to Houses often wore livery—clothing, colors, and emblems—to display who they worked for. The attire identified their statuses. Depending on the relationship or level of service to the House's Seat, badges were sometimes issued and worn. Over time, the use of badges became more and more restricted to House servants, especially those with authority. Badges of service ultimately developed from these livery badges and public servants became easily identifiable by the prominent display of their badges. It was only natural that when the modern police force eventually evolved, officers would adopt the badge to indicate their position, authority, and service. And in case you're wondering, yes, four-footed K9 "officers" receive badges, too, in many jurisdictions. The profession's most visible symbol of service has taken on an almost iconic meaning as the professional of policing has evolved. To the police officer, the badge represents the public trust with which she has the authority to act and to which she has the duty to remain true. From a practical standpoint, officers wear badges as a means to identify who they are and who they work for. The law enforcement badge is an easily recognizable sign of legal authority. From an altruistic perspective, uniformed police officers proudly wear their badges to show their allegiance to the communities they serve and the pride they have in their profession. The badge represents the final goal of arduous training for recruits preparing to graduate from the police academy. Earning the badge on graduation day represents the culmination of a tremendous effort and achievement, as well as a new beginning in a new career as they enter field training and ultimately solo patrol. 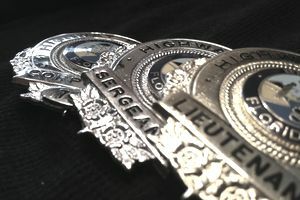 Many police departments and law enforcement agencies issue requirements as to where and how officers must display their badges. Others don't, so you might see that badge attached to a belt strap in these jurisdictions. The left front pockets of most police uniform are usually reinforced to hold the weight of the badge, however. Why the left side? It's over the officer's heart. But there may be a little history involved here, too. The Knights of old used to hold their coat of arms shields on their left sides. Are You Ready to Wear the Badge? The law enforcement profession needs good, hardworking, and dedicated people to take on the mantle of public service and join the ranks. If you have the desire to serve and to help and protect others, and if you're ready to make sacrifices to ensure the safety of your community, perhaps you should consider becoming a police officer and putting on the badge.